As of this writing, the latest version is 4.7.1404.0. For those of you who know me or have at least been following my blog for some time know very well that I’ve been an Apple user ever since purchasing my aluminum MacBook back in 2008. As a result, I’ve been using OS X, iTunes, iPhone, iPod and a slew of other Apple products for years. Right before the switch, I was working with Windows Vista and Windows Media Player 11 and 12 and some junkie MP3 player. I won’t go into how irritating this was because most of you know how bad Vista was and Media Player didn’t have much going for it either. And then Windows 7 came out. I actually really liked it, but by this point, I was practically converted to an official Mac user and was known to my friends (for better or for worse) as a “fanboy”. I couldn’t help it—Apple just had it! The simplicity of everything really caught my eye the visuals just added to the chaos. But having been a Windows user since version 3.1, I couldn’t let go entirely and thanks to BootCamp, I was able to keep running Windows on my Mac. Now I’m bored of my iPhone and after testing some Android devices, I only have one other OS to test: Windows Phone. With that said, I wanted to get a feel of Microsoft’s new image. Step 1, download Zune. The Zune software just brings an element of style, cleanliness and integration that is not matched by any other music player, namely iTunes. 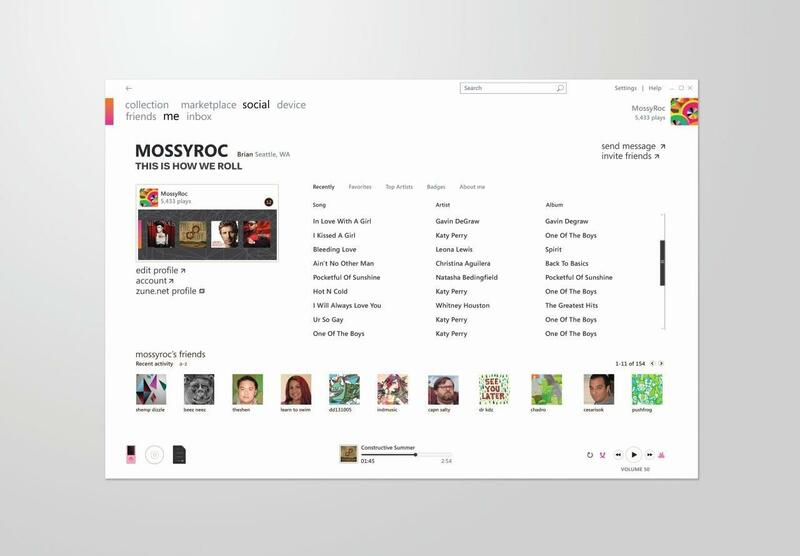 I think the most striking feature of Zune is how one thing seems to flow right into the next. In other words, most computer software is used by navigating intuitive GUIs either by opening menus, clicking on windows or resizing frames, but with Zune, it’s almost like you’re navigating one big image. Even the standard Windows title and status bars are non-existent. 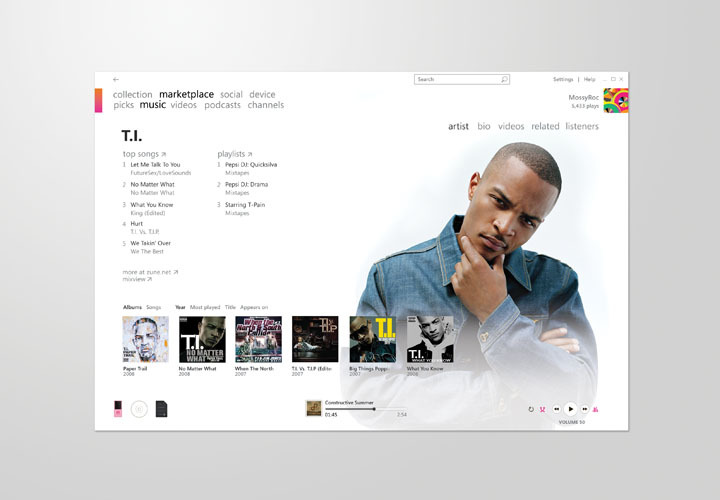 I think when it comes to comparing Zune to iTunes, the biggest concern is the music store. iTunes is known for its vast entertainment store, so how does the Zune Marketplace stack up? Currently, iTunes has about 13 million song titles available for download while Zune only carries about 11 million. While iTunes holds the lead on this, you should understand that Apple had a huge head start in the music business and Zune has caught up really quick in the last few years! Another plus for Zune is that the currency used to buy music, movies, videos and other items is the Microsoft Points system, so if you’re an Xbox Live customer, everything is integrated. Each song is about $0.98 cents with a lot of albums priced at only $10.00. If you want to see how far your Microsoft Points will travel, check out this Microsoft Points calculator. If you don’t care to click on that, then just know that one U.S. dollar gets you 80 points. Zune Pass is a subscription service that allows you to download any number of songs for play on up to 3 Windows computers and 3 other Zune devices for $14.99. This songs are only available while the subscription is active and they can’t be burned to an audio CD. Each song is in the WMA format with a bitrate of 192kbps and also carry the DRM protection scheme to prevent sharing. As part of this subscription, users are allowed to download 10 songs per month that they can keep forever even when the Zune Pass is cancelled. However, if you don’t use the 10 song credits each month, they will be lost! This is an incredible feature and one that is worth the money by far! For such a small monthly fee, you have access to over 11 millions songs. Where else are you going to get service like that? I jumped off the Microsoft bandwagon back in 2008 and never looked back. To me, they seemed to be releasing products that were un-intuitive, missing key features, not fun to use and very problematic. Basically, Microsoft just wasn’t exciting anymore. Today, it’s a different story. Just like Apple has their trifecta—OS X, iPhone and iTunes, Microsoft has theirs—Windows 7, Windows Phone and Zune. If you add on top of that the Xbox 360 and Xbox Live, Microsoft is slowly coming ahead. I have to say with all honesty that I’m very impressed with how Microsoft has revamped their entertainment offerings. The real test begins when I get my Windows Phone for comparison to my iPhone 4/iTunes combo. Look out Apple, Microsoft might be taking me back.